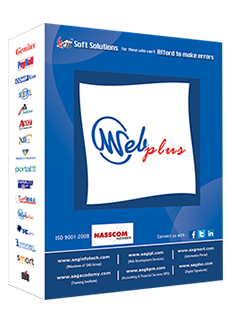 WEB PLUS is developed aesthetically as a fully accomplished and powerful web applications that help organizations around the world reduce overheads, increase operational efficiency and enhance real-time user experience. Our technical experts are highly skilled and diligent professionals who have consistently excelled in their respective areas of capability. They possess in-depth knowledge of design and are proficient in various coding and scripting languages such as, HTML, XHTML, Java, MySQL, ASP, PHP, .NET and Ajax etc. From web based communication system to participation and collaboration, our services cover collective requirements of enterprises, giving them optimum flexibilities to leverage our Web Design & Development capabilities to better-communicate and operate with all stakeholders. Beyond managing existing content, SAG CMS lets users easily create and manage everything from a simple article of text and images to full functional web sites. Web publishing works alongside SAG Portal’s larger collection of applications, which means that you can add in shopping cart functionality, visitor polls, web forms, community collaboration tools and more. Everything is done with our collection of easy-to-use tools with familiar rich-text editors and intuitive interface. Client can published its information on portal using SAG CMS. Blog it forward: There’s so much wonderful content online. Why keep it to yourself? Now you can share it on your blog – in seconds. Share it. Share copy, images, and video – from other blogs or sites like Flickr, YouTube, Vimeo, and Photobucket. It’s as simple as sending an email. Attract new readers: When other bloggers share your content with Blog It, a link back to your blog is included, making it easier for new readers to discover you. Uploading images to your Pixpa portfolio gallery is a breeze. We have developed a multi-image uploader which you can use to upload single or multiple images to any of your galleries. The uploader also automatically resizes your image to best fit your website, creates default thumbnails and optimises your images to ensure a balance between image quality and loading time. You can sort and sequence your websites menu structure, and galleries as well as images in any gallery. Use the sort order number in your menu structure to sequence links and galleries.To sort and sequence images in any gallery, simply use the intuitive drag-and-drop interface to sequence images as you wish and then save your sequence. Its as easy as that. The simple menu is probably the most frequently used menu control of all - in fact it is in use on this website, as the main left-hand navigation. The menu shows all pages that exist within the current level in the navigation as well as pages that appear in the parent levels. The menu has the option to enable security, so you can personalise the experience of users visiting the site and only show them sections or pages that you have given them permission to access. Permissions are totally granular so you can be assured you will be able to configure the permissions the way you want. Having your very own search engine for your site will enable your visitors to quickly and easily find just what they are looking for, without having to navigate through numerous menus or wade through long lists of options. Your users can just type in a few keywords for what interests them, and within seconds they are shown to the exact pages on your website that are relevant. Usability studies show us that more than half of all web users are search-dominant, meaning that they will go straight to the search box when they enter your site, rather than try to find information following your navigation links. They are not interested in looking around the site but rather in finding what they want as fast as possible. Convey information and facilitate conversations around blogs directly. Liferay's Blogs provide the best features of modern blogging tools and allow you to keep up with everyone's thoughts and activities via dynamic RSS feeds to your email or a "Recent Blogs" display. Sending bulk sms messages couldn’t be any easier. Our user friendly SMS Manager allows you to send a single or mass text messages to any mobile phone using your web browser. There is no software to install, just login to your account online. Instead of toggling between Literacy and your preferred email client, simply send and check email directly through Social Office.A full AJAX-based webmail client can be configured to interface with many popular IMAP email servers. This allows users to keep track of people both inside and outside the organization and automatically adds colleagues that share Site membership. Uses can email an entire group of Site members all at once. See what everyone is up to. Activity tracking keeps tabs on personal and team activity and displays this information in various “Recent Activity” viewers for each specific tool, for all items tagged with a certain key word and on a Facebook-style Activity Wall.Tracking works for wiki entries, blogs, message boards and recent activity in the document library! Each user can fill out their own online resume-style profile that can help members discover expertise in the organization. Support project profiles, profile tagging, and personal information. Convenient Navigation:-User want the interface easy & understandable It is a significant point not to confuse the visitor of website and thus not to make him leave and forget about its existence. Proper Content:- What the users like very much is a content they are promised to see on the website. You better not play with it. Once disappointed the visitor may not come again to see whether something has changed so we give the best quality of content. Search Option:- In case your website is crammed with different information it will be very convenient for the user to find the necessary content with the help of search field so we provide appropriate search option. Sitemap:- Another useful option of your website is a sitemap which usually is of two types. One is for search engines and the other is for the very visitors. Images:- Building your website you of course paste a lot of images there to make your online presence look nice and eye-catching. So it is very important for all the pictures to be of the proper format – neither too large nor pixilated. and we take care of this point very appropriately. Ping :-This utility can be used to determine whether there is a problem with the network connection between two hosts. LINK CHECKER:-This tool will read the page you specify, extract the links from it and test the status of each one. If any errors are found (broken links) these are reported. LINK EXTRACTOR: - This utility will extract all the links from a web page you specify and list them. IP Address Locator:- This tool will give you the physical location of the computer that has been assigned the IP address you are looking for.